The pull of the world is strong. From the moment we wake up, there are a hundred things just on the way to the kitchen that could distract us from what is most sacred and important. The world spins us into hurry. It pulls us into self-doubt, into isolation. In our “on-the-go” culture, these days we need ritual like we need breath. Ritual aligns us with the rhythm of nature rather than the “dings” from our electronics. It focuses us in the midst of myriad distractions. It offers us a respite in a world that will keep us going 24/7. And ritual reminds us of what is most important, offering us a pause to recommit ourselves to living with intention. Instead of making New Year resolutions, put attention into creating rituals in your day. Make it simple, significant and nourishing. Listen to the call of Winter. Winter is a natural time when we are drawn inside – inside our homes and inside our hearts. When we honor the invitation of Winter, the snowy, cold days can be a time of deep nourishment and rest that carry us into the Spring months and ready us to fully embrace the call of Spring. Next Wednesday, January 14, we will explore simple and nourishing rituals that we can bring into our everyday life with our first Mind-Body Connections workshop of the 2015. We’ll definitely have a meditation, too. 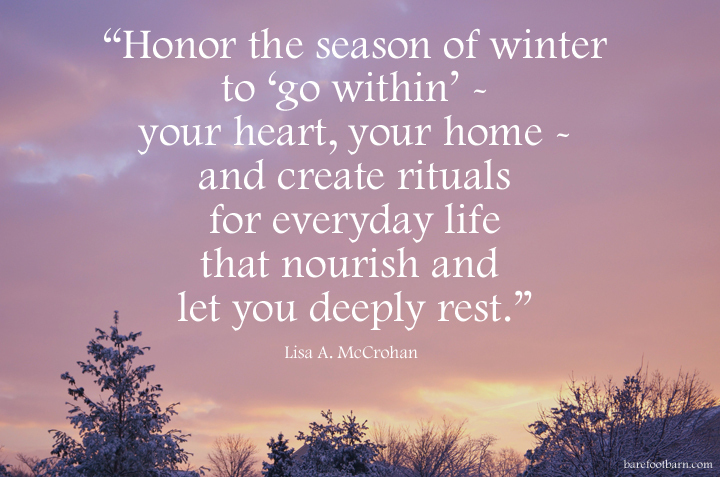 Let this Winter be one of honoring the sacred invitation of the season to deep rest, nourishment, and healing. Start this year off with a commitment to reconnect to and align yourself with the rhythm of the seasons for a deep sense of well-being, grounded in what truly matters in your life. This post was written by Lisa A. McCrohan, MA, LICSW, RYT, Wellness Workshop Facilitator, Psychotherapist, Compassion Coach and Soulful writer at Barefoot Barn.